AURORA, COLORADO August 30th 2018. Multicultural Mosaic Foundation (MMF) is a Colorado based non-profit, dedicated to understanding, dialog and peace. Since 2016 our foundation has received several direct or indirect threatening messages. 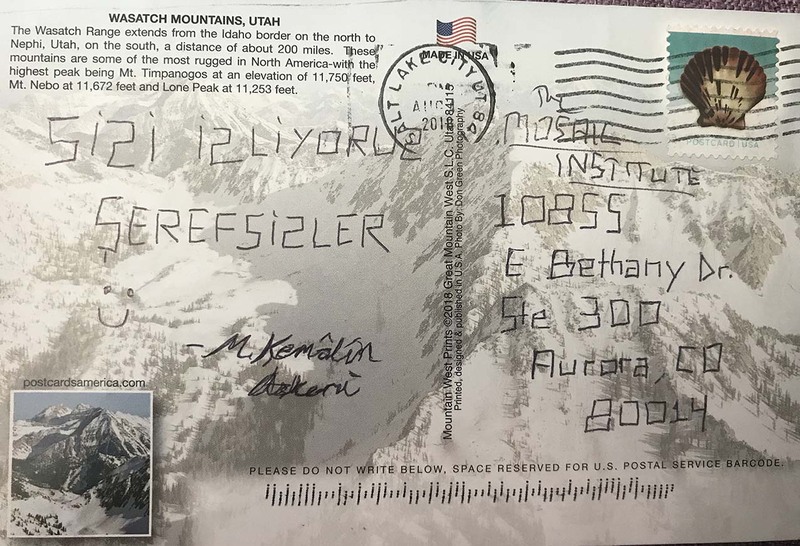 An example can be seen in the attached postcard written in Turkish which translates, “We are watching you inglorious” signed by an anonymous person referring to himself as M. Kemal’s soldier. We received this one in August 2018. The purpose of this press release is to outline our perspective on this incident and other such similar incidents. First, MMF abides by the laws of the U.S. and we are in close cooperation with federal and local law enforcement. Therefore, we pass these threats to them immediately and consult with them on this, as well as other issues that may be relevant to our community. Secondly, we are open to people from all walks of life. Everybody is free to join us in our events and programs. We organize programs and events to foster better understanding, respect and dialog among all cultures and faith traditions. One of our principles is to accept every human being regardless of their color, background, ethnicity, race, sexual orientation, culture, political views or language. We are open to sitting down with everyone to discuss matters that will foster peaceful coexistence. We prefer open communication regardless of whether it is critical or constructive. Therefore, we love to be watched, we appreciate being watched, and we invite everyone to watch us. Messages similar to the one on the post card demonstrate that there is still a lot of work to be done. This message motivates us to be more engaged and active in the areas in which we are already active. We will continue our work with our allies as we believe that it contributes to mutual respect and peaceful coexistence. We invite all to our upcoming events. Please visit our web site (www.mosaicfoundation.org) for a listing of events. Please click here for PDF version of press release.